Writing from the prospective of a remodeling professional, who has seen dozens of water damaged showers and the additional damage they inflict on other areas of the house, I highly recommend that you NOT put off a repair of this nature. If you think there's a problem--have it investigated! The longer a leaking shower goes on, the more money its going to cost you to get it fixed. It is not unusual for the water damage portion of the bathroom remodel, to surpass the cost of the tile and labor to redo the bathroom. Water escaping your shower pan liner will rot the vertical studs, sheeting under the shower, floor joists (that hold up the floor), exterior sheeting and siding, and can cause severe damage to the walls underneath the bath. What to look for: cracking in shower floor at vertical shower walls, discoloration of grout at bottom of shower, and moisture outside shower at shower curb corners are all indicators of spreading water damage. Additionally, if you see dark spots in the drywall in the walls under the shower (like on first floor under bath), thats another sign that something is wrong. Do not ignore these signs! The longer you wait to fix this problem the more its going to cost to fix it! Call us today for a free estimate. We specialize in this type of multi-trade repair--we will handle all the work that needs to be done and restore your home to better than new. If you need another reason to address a problem such as this, water damage causes all types of mold. Mold can be very dangerous to children, pets and you. It is very possible that this mold can develop allergies and other health problems in your children, pets, and you from continual exposure to the mold spores escaping from these moldy areas of the home. A perfect example of what nightmares can be behind the leaky shower walls. 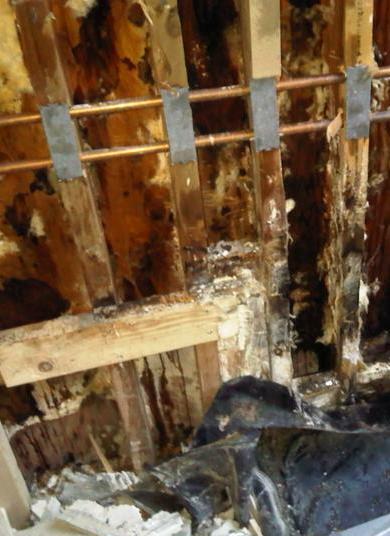 This home's Master Bath was leaking for three years before it was repaired. At that point the damage went right out through the siding on the second floor and required extensive repair to the exterior of the first and second floor of the house.